Clarets boss Sean Dyche is happy with his pool of centre backs, despite the record departure of Michael Keane. Keane left for Everton in a deal worth up to £30m, leaving Dyche with Ben Mee, James Tarkowski and Kevin Long as senior central defenders. He also had a look at summer signing Charlie Taylor there in Tuesday’s friendly with Celta Vigo at Turf Moor. But while you can never say never in the transfer market, depending on who becomes available and players that might be offered to the club, Dyche is relaxed about the competition in that area, ahead of the first Premier League game at champions Chelsea a week on Saturday. He said: “Ideally we like to have two for each position so there’s competition. “We’ve got three recognised centre halves and Charlie Taylor, who I think could adapt into a very good centre half actually. “We haven’t brought him in for that reason, but played him there the other night just because I like the look of him. “I like to be open-minded with my players and where else they could play. If one is right for us, and fits what we’re about, then we would be interested. 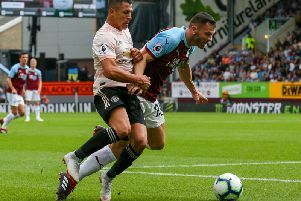 Tarkowski is in pole position to partner Mee, having got the nod in Mee’s absence to play alongside Keane in Burnley's only away win last season at Crystal Palace, before playing the last three games with Long, as Keane picked up a calf niggle. They are Tarkowski and Long’s only Premier League starts, but Dyche isn't afraid to allow them to learn on the job, as Keane himself did three years ago after arriving on loan with vast potential: “A few years ago we put our trust in Michael Keane and that worked out all right. “You can’t guarantee it. You develop the players with a view to improve and over that period doing well now. “We can all throw players in to develop them, but it might cost you in the long run. “You need to find that fine line between developing and being successful as well. “The challenge comes if you throw too many in at one time and you’re not winning. “Keano needed to go through that last time in the Premier League to get to where he’s got to.